Try to help this amazing kitty to eat every mouse on each level. 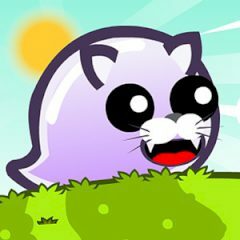 By the way, you have limited jumps, so, use it rationally and catch all the food as soon as possible, cause your cat is so hungry and he is already waiting for you! Enjoy the game. Oh no! This cute kitty is so hungry and you must feed him as soon as possible! There are a lot of puzzles, where you must catch all mouses here. So, be sure that you can do it, just use the mouse to aim and jump. Is everything clear? Then go ahead right now and you will cope with it. With the every next level it could be more and more difficult, so, just beware of any obstacles and sink into the most cruel world. Are you ready for that? Then go ahead and help this sweet cat to eat all of them. Have no doubt that you will love it.